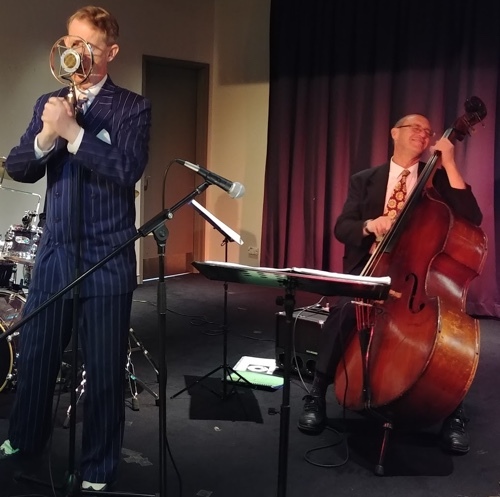 Greg Poppleton returned to Penrith RSL Saturday 30 June for another of his popular 1920s - 1930s jazz shows of swinging songs from the Great American Songbook. 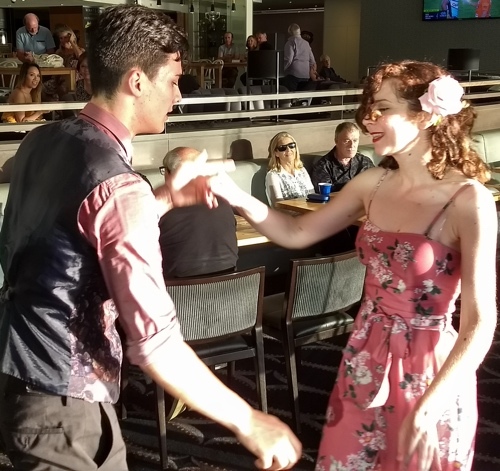 And Greg will be back at Penrith RSL for dancers, Saturday 10 November, 2-5pm. FREE. 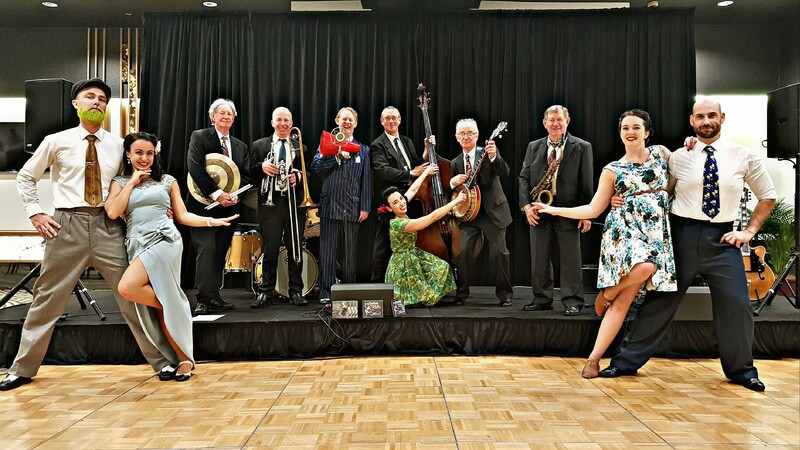 Swing dancers Sue Ann and Sandy pose with singer Greg Poppleton, Dave Clayton double bass and Damon Poppleton alto sax. It’s free, it’s fun, it’s informal. And there was plenty of dancing. 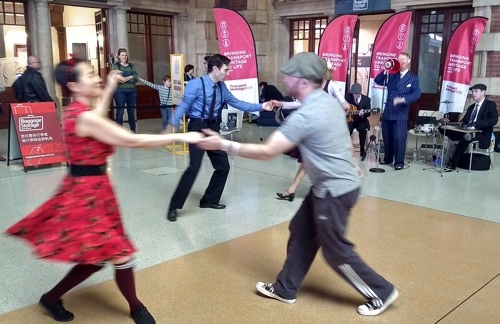 Swing dancers are always welcome with a good sized dance floor. 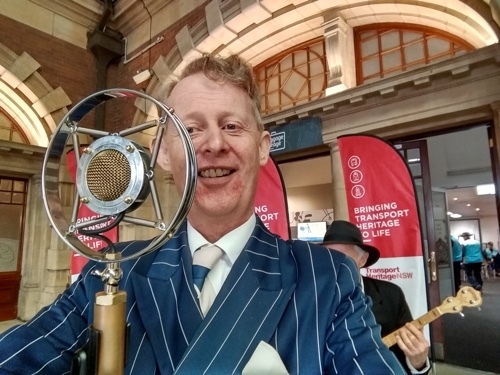 Greg is Australia’s only authentic 1920s - 1930s singer. 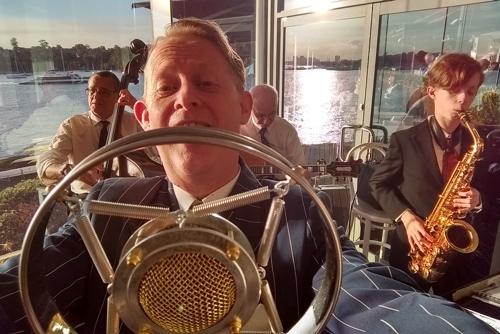 Unlike other jazz singers who find jazz after a journey through rock, opera or miming to a parent’s record collection of snappy-fingered Vegas crooners, Greg’s 1920s-30s vocals are authentic and original. He fell in love with the music age three. That's when he first heard Louis Armstrong. 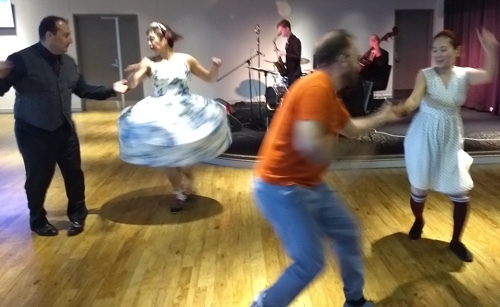 Dancing to Greg Poppleton with Bob Gillespie drums, Damon Poppleton alto sax, Dave Clayton double bass and Grahame Conlon guitar and banjo. He has over 1.2 million total YouTube views for his four albums. That makes him Australia’s most listened to YouTube jazz singer without TV exposure. 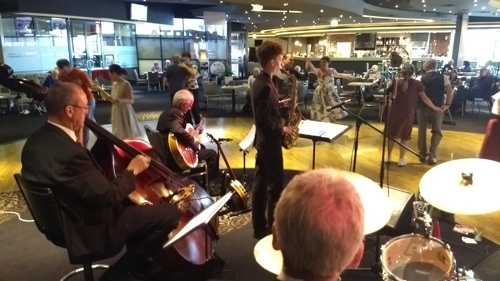 He returned to Penrith RSL, Saturday 30 June, with his Jazz Deco band. 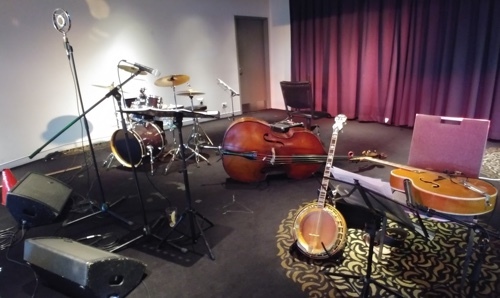 Greg Poppleton Jazz Deco band instruments on stage. 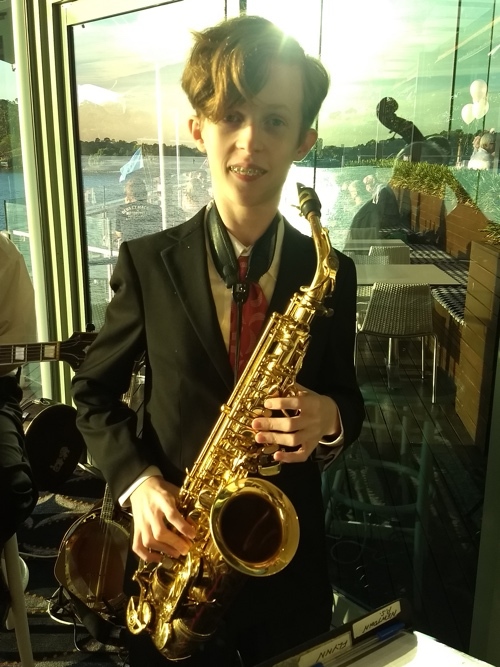 In the band was Greg’s up-and-coming 15 year old jazz alto saxophonist son, Damon Poppleton. 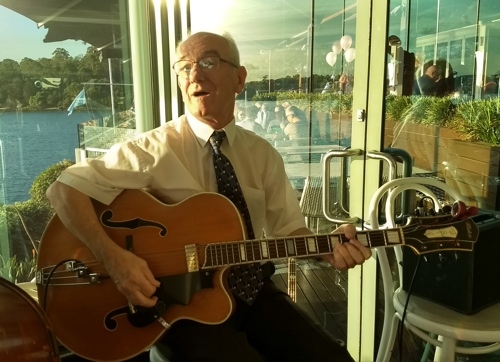 Grahame Conlon, who was in Ricky May’s band was on guitar. 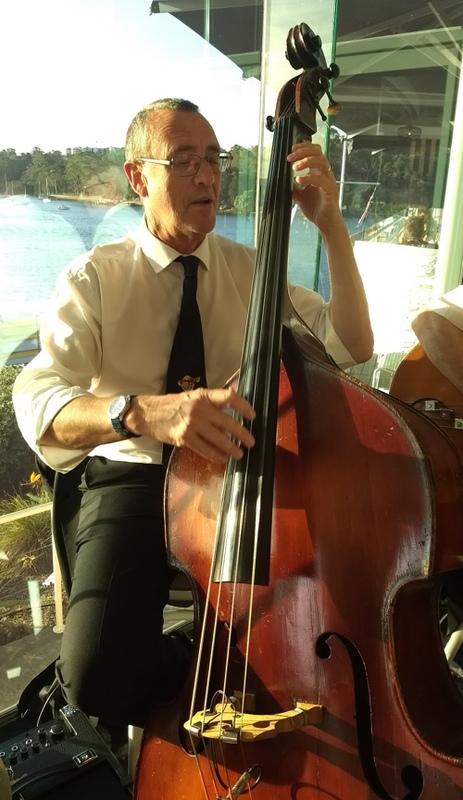 Blue Mountains double bassist, Dave Clayton, who was in Mic Conway’s Hiccup Band played double bass. 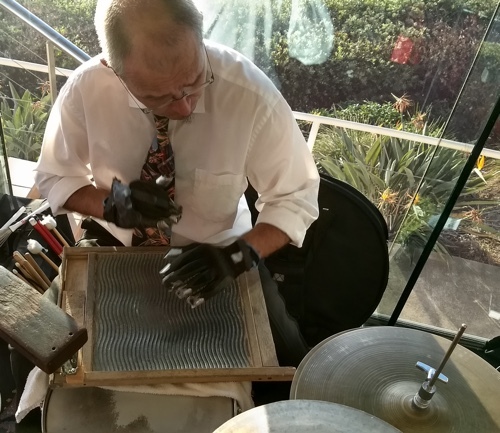 And Penrith local, Bob Gillespie, who played in Maynard Ferguson’s English Orchestra, was musical director for Lovelace Watkins and was drummer for the 1990s Australian tour band of the original Glenn Miller Orchestra, was on drums. Saturday 10 November 2-5pm. FREE! Free parking. Dance floor. Bar, bistro and child friendly. PLUS grow 2" taller, increase your attractiveness, ensure promotion at work, boost your confidence, stimulate hair growth and increase your IQ! 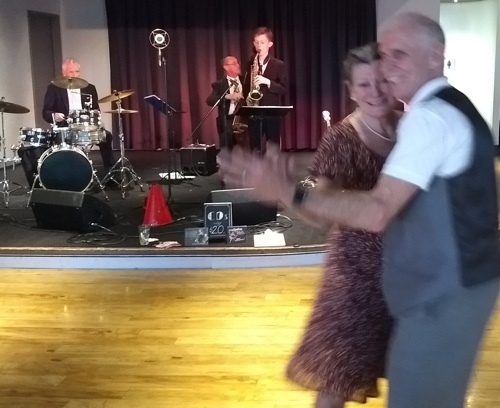 Photos - Swing Dancing As Greg Poppleton Makes Jazz Deco Pop! 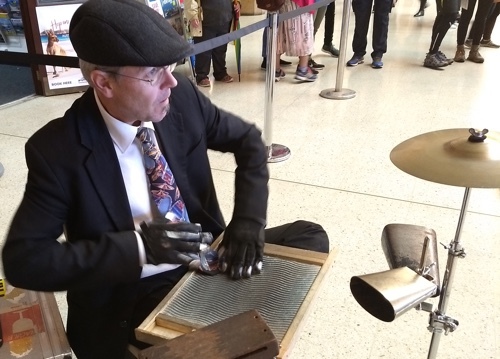 Photos from the final day of Greg Poppleton making Jazz Deco Pop at Sydney's Transport Heritage Expo which ran 9 - 11 June. Enjoy! 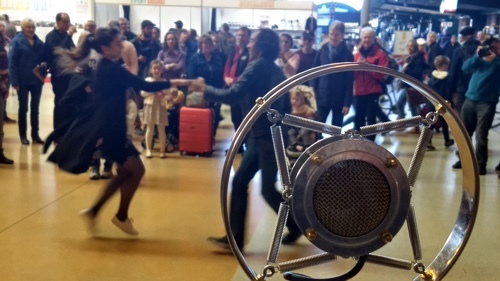 Thank you to the swing dancers from Swing Patrol, Swingtime, Swingaroo, Harbour City Hoppers and All About Swing who danced toGreg Poppleton's 1920s-1930s jazz deco swing. 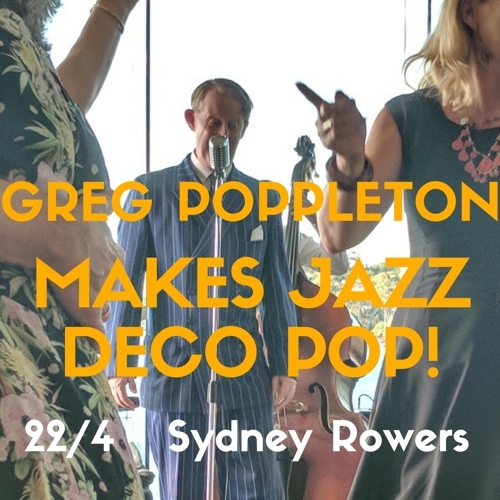 Greg Poppleton 1920s - 30s Singer makes Jazz Deco Pop! 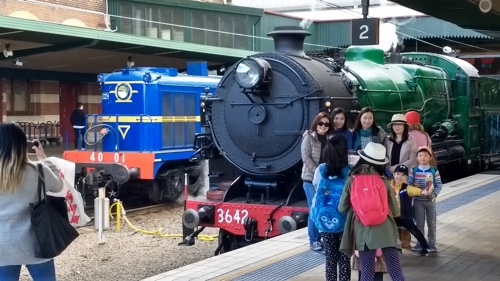 And, of course, the vintage trains! 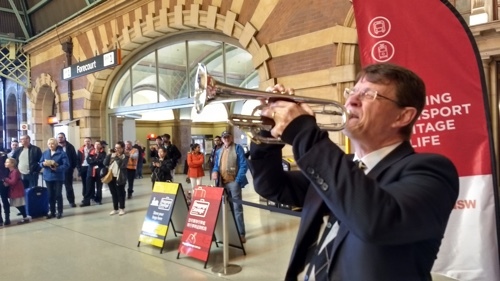 Greg Poppleton's jazz deco swing quartet played the songs of the 1920s - 1930s today at Sydney's Central Station. 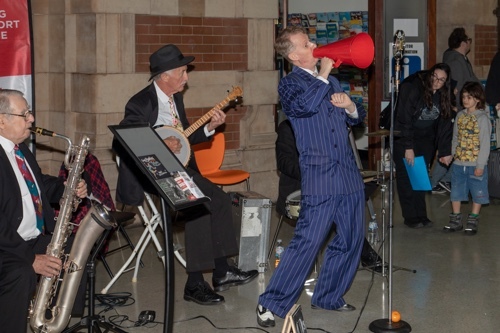 We're playing at Central all June Long Weekend (June 9, 10 and 11) for the Transport Heritage Expo. 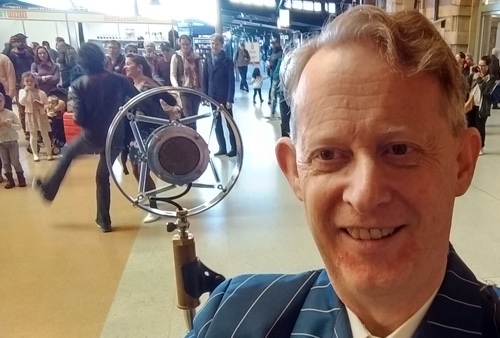 I just realised as I write this that today is the 34th anniversary of my first radio broadcast. But that's by-the-by. 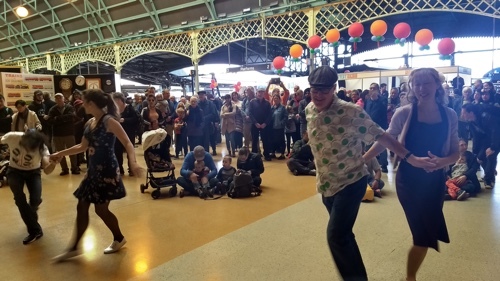 Today, we were 'Swing Dancer Bombed' with dancers from Swing Patrol, Swingtime - Dance School, Shagaroo Collegiate Shag and Harbour City Hoppers!! At Central this Sun & Mon, too 10am-2pm. 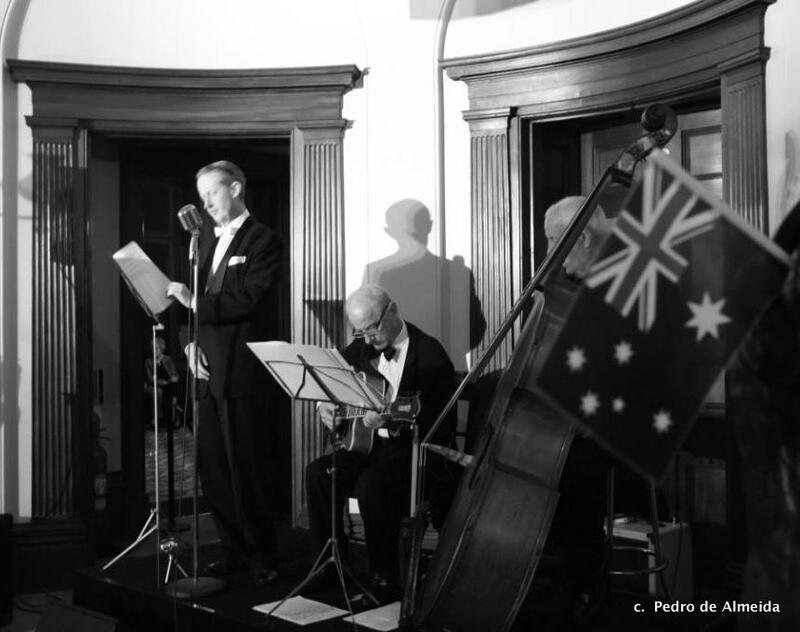 Greg Poppleton, Australia's only authentic 1920s - 30s singer and his Jazz Deco trio had the honour of playing for dancers at Elizabeth Bay House for the exclusive 2012 VE Day GI Dance. 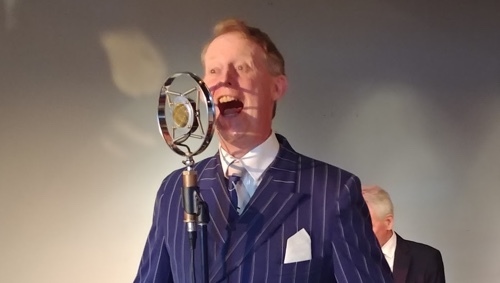 Greg sang the songs popular in the early 1940s in his naturally true-to-the-era dance band singer style. 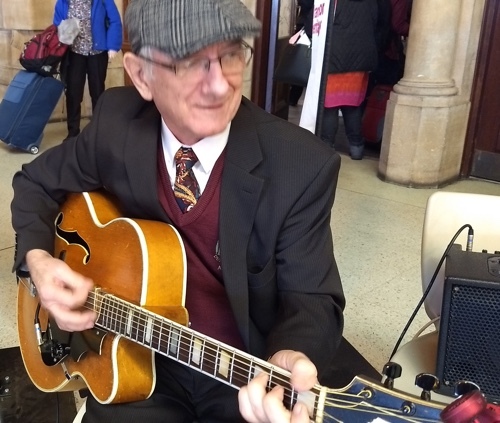 Some say his voice reminds them of Al Bowlly. Others say Ray Eberle. 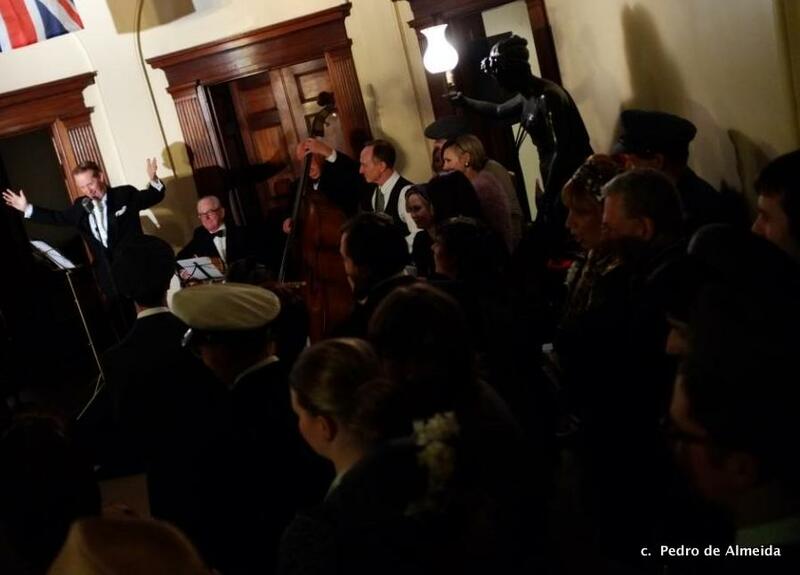 This fantastic evening celebrated the GI Dances held across Sydney in grand houses like Elizabeth Bay House during the Second World War. 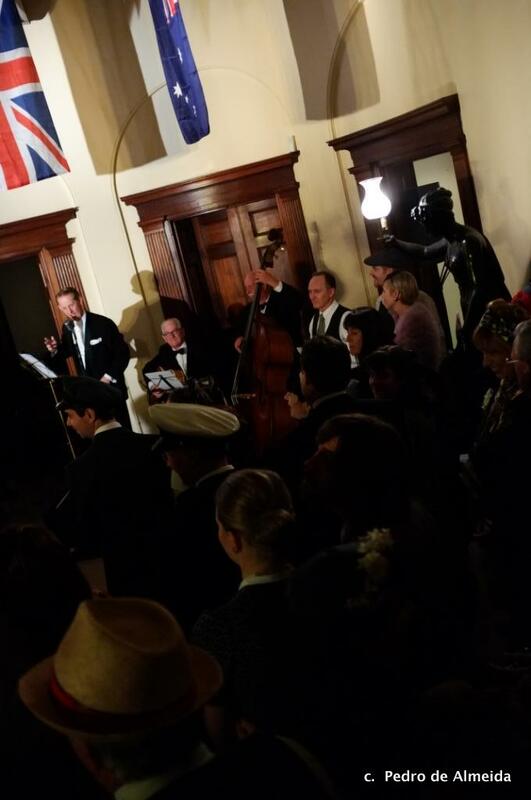 Over a hundred guests filled the historic mansion dressed in 1940s style, many in authentic 1940s uniforms. 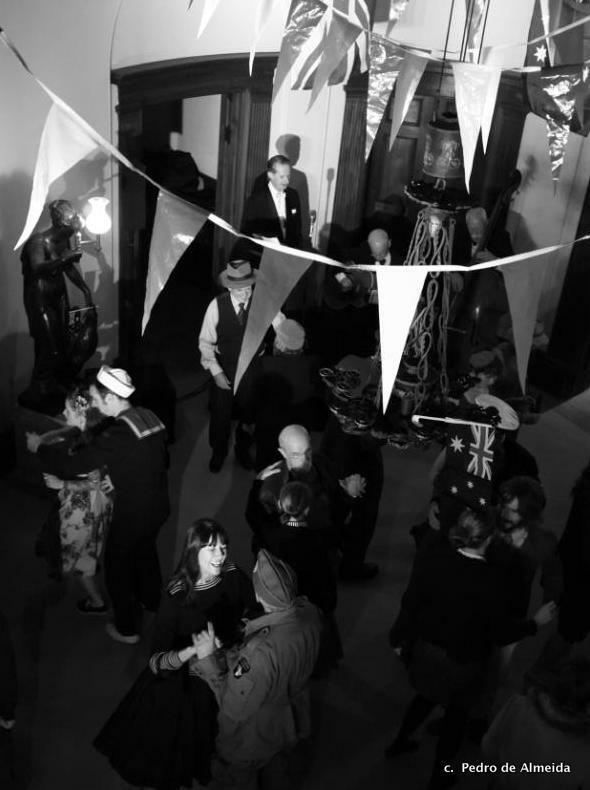 They danced to Greg Poppleton playing A Nightingale Sang In Berkeley Square, White Cliffs Of Dover, I've Heard That Song Before and many other pop songs of the early 1940s. 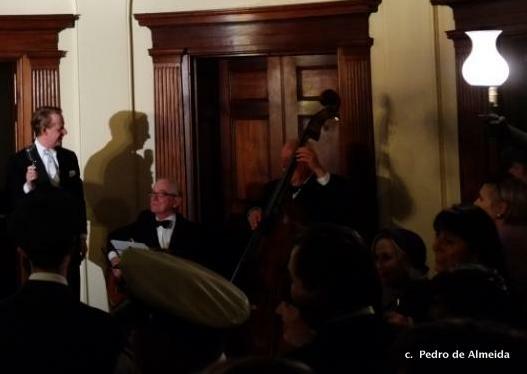 At the end of the night, the band lead the guests in singing We'll Meet Again, Vera Lynn's post-WWII hit Auf Wiedersehen, Sweetheart. Guests calling for an encore spontaneously sang out two choruses of Bless Them All as a gloriously emotional end to the dancing! 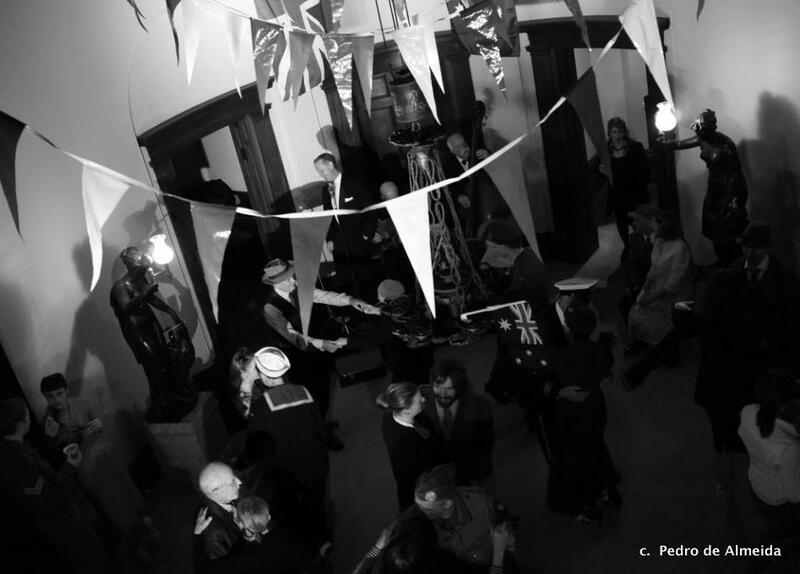 All guests were gloriously dressed in vintage style, with many in authentic clothes and uniforms from the era, as you can see in the photos. 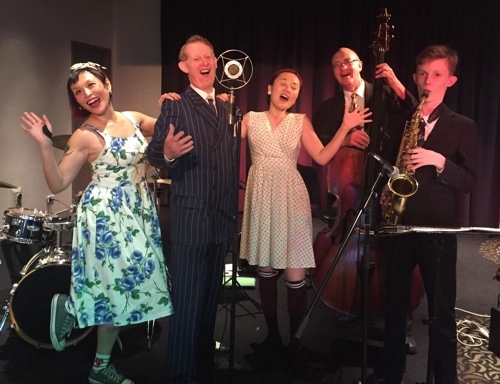 Greg Poppleton is Australia's only 1920s - 1930s style singer with duo to 6-piece band. 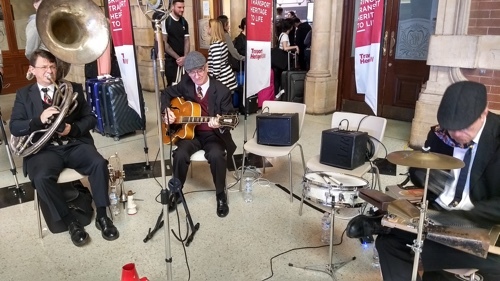 He can also offer a 1920s Great Gatsby Orchestra and 1930s-40s Swing Orchestra playing Glenn Miller, Artie Shaw, Duke Ellington, Tommy Dorsey and Benny Goodman. 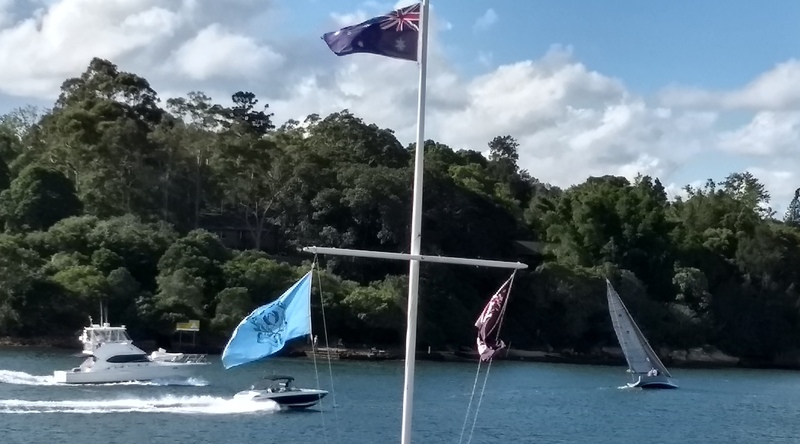 Contact Greg through Tony Jex at OzManagement.